The mission of HAND is to serve the Nepali people who suffer from disabilities of all types. We have a special mission to help the children of parents with disabilities, as they are the future of Nepal. We also conduct most of our work in the remote villages of Nepal. Your dream can become reality with the trip of a lifetime in April 2016. We will begin our trek on April 16th with a breathtaking flight to the Sherpa village of Lukla. From the Sherpa village of Namche Baazar we will take the “road less traveled” as we turn off of the main trekking route and cross Rejo Pass, climb Gokyo Peak, spend a night at the shores of beautiful Gokyo Lake, then cross Chola Pass and join the main trekking route at Lobuche. Click on the map above for additional photos of the trek. The views are breathtaking throughout the trek. After completing the Everest Base Camp trek, those who have dreamed of climbing a Himalayan peak will continue up 21,247 foot Mera Peak. Those wishing to return home will return to Kathmandu for their return flight home. The trek/climb will be led by Brian Smith HAND Executive Director/Founder who reached the summit of Mt. Everest in 2007, and a climbing Sherpa. Brian is also a Certified International Tour Director. The logistics are provided by 10 time Everest summiteer Tendi Sherpa. Trek type: Tea House trek, but sleep in the tent. 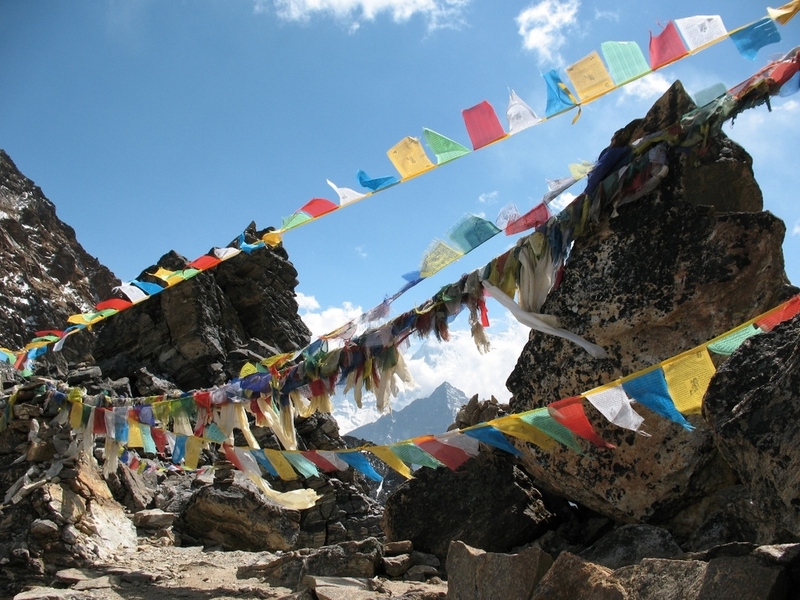 Trek area: Renjo pass, Gokyo Peak, Chola Pass, Kalapathar and EBC and Mera Peak Climb. Trek end Point: Lukla and then Kathmandu. Total Days in Mera Peak: 13 days (including reserve day). Maximum Altitude: 5545m. Kalapathar top. All airport arrival and departure transfers. 3 night hotels on twin sharing basis with breakfast at http://www.hotelmarshyangdi.com 3 star hotel. One day Kathmandu city guided tour with all entrance fees. Kathmandu and Lukla flight tickets and air cargo charges. All meals and tent during the trekking in Khumbu and Mera peak. All necessary trekking permits for Khumbu EBC and Mera Peak. 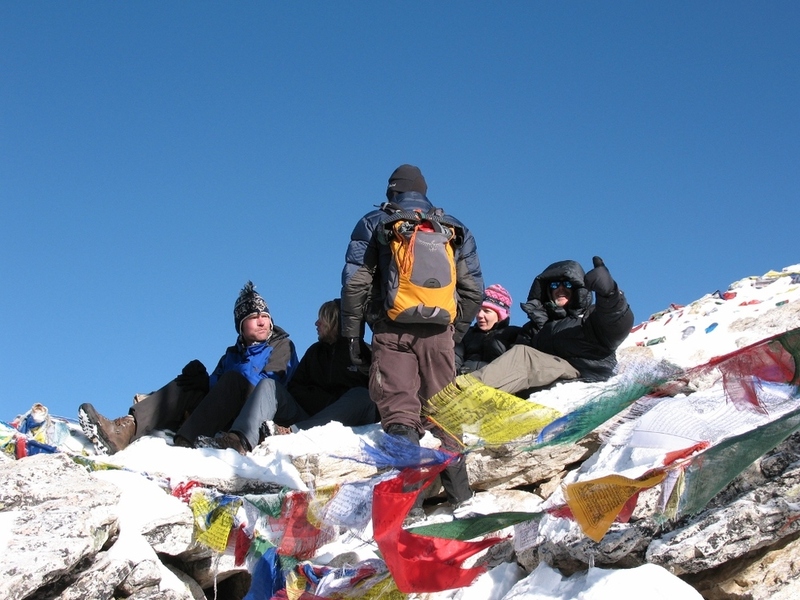 One local Sherpa guide along with other assistant guides depending on the group size. For Mera Peak we will provide you the same guide from Khumbu trek as your assistant guide and we provide all his summit bonus, equipment allowance, daily wages. All necessary trekking porters both for Khumbu and Mera region. All salaries and accommodations and insurance for the field staffs. Personal trekking & Peak climbing gear (you can also rent in Kathmandu such as Crampons, Ice Axe, Boots, sleeping bag, Jumar etc). Use of internet in Kathmandu and during the trekking. Tips for the field staffs at the end as per your wish. Day 02: Sightseeing and preparation day. Day 05: Acclimatization day around Namche Bazar. Day 09: Climb Gokyo Peak , 5357m and trek to Thangnag 4700m. Day 10: Climb to Chola Pass 5420m, and trek down to Zonglha, 4830m. Day 12: Trek to Everest Base camp, 5364m and over night at EBC. Day 14: Trek to Namche Bazar, 3440m. Day 15: Trek to Lukla 2860m. Day 16: Reserve day for in case of anything. Day 16: Trek to Kharkiteng, 3550m. Day 17: Climb to Chhatarwa La, 4600m and overnight at Chhatarwa, 4200m. Day 18: Trek to Kothe, 3550m. Day 19: Trek to Thagnag, 4300m. Day 20: Trek to Mera BC, 4900m. Day 22: Climb to Mera High Camp, 5770m. Day 23: Summit Mera Peak, 6461m and descent to Khare (Base Camp 4900m). Day 24: Trek to Kothe, 3550m. Day 25: Trek to Chhatarwa 4200m. Day 26: Trek to Lukla, 2860m. Day 27: Reserve day in case of weather issues. Day 28: Fly to Kathmandu and transfer to Hotel.